This air cushion type of unit is designed for the study of simple harmonic motion. 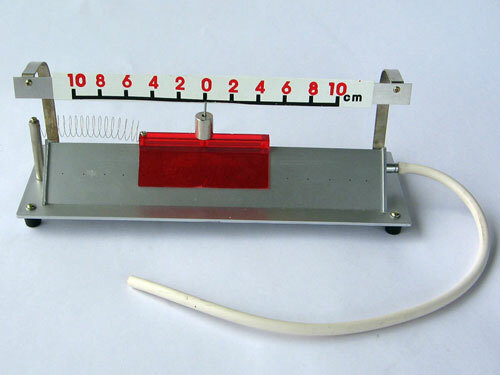 The air track helps reduce friction and allows the students to accurately determine the relationship between the period of the vibration and the mass of the oscillator. This unit can also be used to demonstrate the conversion between kinetic and potential energies, and the damped oscillation due to air friction. The attached weight (24g) can be added to the oscillator to vary its mass. A fish tank pump (not included) can be used as an air source.